Make a huge 46 percent saving on one of the best gaming mice around. Hello again, old friend; the Razer DeathAdder Elite is on sale at Amazon for $37.99 instead of $69.99, a deal valid for today only. Although it often has its price slashed, this is the cheapest it’s ever been. It also saves you 46 percent ($32) on what some argue is one of the the best gaming mouse options for PC. What’s more, you can make a saving on the excellent Razer Firefly Chroma Cloth mouse pad to go with it. That’s going for $34.99 on the same site, a big reduction of $25 from its recommended cost. As with the DeathAdder, that’s its lowest price. However, you’ll have to move quickly. Both deals will end at midnight Pacific time. The DeathAdder Elite has hovered around the number 1 and 2 spots of our ‘best mouse’ guide for a very long time, and there’s a good reason for that. With flawless tracking thanks to a sensor based on the PMW-3389, it boasts 99.4% resolution accuracy and a 450 IPS rating. When you throw in a design that will fit all manner of hand shapes and grip styles, this becomes quite the catch-especially for $37.99. As we mentioned in our top gaming mouse feature, it’s the perfect choice for most gamers. “It’s simple where it should be, with two perfectly placed, generously sized thumb buttons, has a great optical mouse sensor that will work on both hard and cloth pads, and has the ultimate body shape for a claw or hybrid claw/palm grip”. Honestly, you can’t do much better. As for the Razer Firefly Chroma Cloth, it’s a range we’ve had good experiences with. 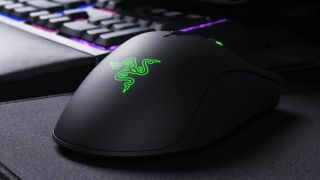 This particular version is a soft, flexible, rubber-based design that features lighting effects powered by Razer’s Synapse tech. It’ll go very nicely as a companion to the DeathAdder, especially when both together cost less than the mouse normally would by itself. For more mouse mat recommendations, visit our list of the best mouse pad for gaming.